Proximal first metatarsal osteotomies have historically been associated with and limited to treatment of severe hallux valgus deformities. These procedures are powerful in deformity correction and overall realignment of first ray function because of their ability to correct closer to the deformity's origin. When considering all factors in bunion correction, they are good options for correction of a wide range of hallux abducto valgus deformities. This article discusses the use of proximal metatarsal osteotomies for correction of hallux valgus deformity, techniques to facilitate optimal outcome, and common complications of these osteotomies. Proximal first metatarsal osteotomies allow effective correction of hallux abducto valgus deformities by correcting closer to the apex of deformity. Common complications are nonunion, first metatarsal elevation, difficulty with fixation, and first metatarsal shortening. Opening wedge plates and crescentic osteotomies provide significant deformity correction with minimal shortening or even lengthening of the metatarsal. Advances in fixation have allowed predictable results and have limited the complications commonly associated with proximal osteotomies. Selection of the appropriate surgical procedure for hallux valgus deformities relies on many factors and the large variation of osteotomies provides surgeons with seemingly unlimited surgical options. The hallux abducto valgus deformity incorporates many entities that must be acknowledged when surgical intervention is considered. Increase in intermetatarsal angle, hallux abductus angle, mobility of the first ray, patient age, patient health status, activity level, previous surgical procedures, surgeon skill level, and so forth are all factors in determining the best procedural choice. The goal is to restore functional, physiologic anatomy and to minimize complications, providing the patient with a long-lasting successful outcome. A protocol for hallux valgus surgery that used to be commonly used is distal osteotomy for intermetatarsal angles of less than 13° to 15° and proximal osteotomy for angles greater than 13° to 15°. However, selecting the appropriate procedure is more complicated than radiographic evaluation and intermetatarsal angle. This process is as complex as the cause and characteristics of the deformity. 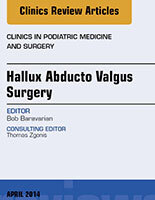 As understanding of the hallux valgus deformity has continued to progress, procedural options have also advanced. Adaptations of osteotomies, improvements in surgical technique, and use of procedure-specific hardware have made proximal first metatarsal osteotomy an appealing procedure for correction of hallux valgus deformities. For this reason, proximal metatarsal osteotomies should not necessarily be limited to the traditional procedural selection criteria of large intermetatarsal angles. The most common application of a proximal metatarsal procedure for hallux valgus correction is with a large intermetatarsal angle. In the past, this was considered for measurements greater than 13° to 15°. Distal osteotomies tend to have an inherent limitation of translation because they are restricted by the width of the metatarsal shaft. In general, it is recommended that distal osteotomies should not exceed 25% to 50% translation in relation to the metatarsal shaft. Exceeding this translation leads to instability of the capital fragment and limitations on fixation, Jahss and colleagues evaluated the geometric principles of first metatarsal osteotomies. With a distal chevron type osteotomy, instability of the construct occurred with any intermetatarsal angle correction greater than 5°. In comparison, a proximal osteotomy allowed greater correction because the center of rotation is closer to the origin of deformity. Because the correction occurs proximally and closer to the axis of rotation, a greater level of correction can be obtained using proximal procedures.5 The geometric placement of the osteotomy allows for a greater distance between the hinge and the most distal point of the metatarsal. A longer radius arm creates a greater lateral correction of the distal metatarsal for each degree of correction at the proximal osteotomy site, which allows the first metatarsal head to come in closer proximity to the second metatarsal and thus reduces the intermetatarsal angle to a greater extent. Jahss discussed general geometric principles in relation to metatarsal osteotomies. In translational or transpositional osteotomies such as a chevron, for each 1 mm of lateral displacement of the distal portion of the osteotomy there is 1 mm of intermetatarsal angle. Both distal and proximal translational osteotomies result in the same amount of correction of metatarsus primus varus. Because of this, they recommended limiting this type of osteotomy to intermetatarsal angles of less than 12°. For rotational osteotomies, such as the crescentic procedure, a base osteotomy has 5 times greater transverse plane effect on the metatarsal head compared with a neck osteotomy. Jahss showed that 15° of rotation at the metatarsal neck results in 2.5° of correction, but 12.5° of correction when performed at the metatarsal base. Wedge osteotomies provide a closer ratio of correction. A 5-mm closing or opening wedge at the neck and base provide approximately 7.5° and 10.25° of correction, respectively. The amount of correction, especially in base procedures, also depends on the length of the first metatarsal because a longer lever arm allows a greater amount of intermetatarsal reduction when performed close to the axis of correction. Although shortening of the metatarsal is a common result of some base osteotomies, such as the closing base wedge, other procedures allow minimal shortening or lengthening of the metatarsal. The crescentic osteotomy has traditionally been an osteotomy that provided minimal shortening. Because the osteotomy relies on closure of the intermetatarsal angle through rotation along the osteotomy as opposed to removal of bone, shortening is limited to the thickness of the osteotomy blade plus any amount of blade excursion. In a retrospective review of 75 patients, Mann and colleagues7 saw an average of 2 mm of shortening at a mean follow-up of 34 months. Opening wedge osteotomies also have the ability of deformity correction without shortening of the first metatarsal. However, in the past, this type of osteotomy was bypassed in favor of closing base wedge osteotomies for large metatarsus primus varus deformities because of the limitation in internal fixation. With the improvement of fixation options and the advent of opening wedge plates, the proximal first metatarsal opening wedge osteotomy has gained popularity over the last several years. Opening wedge plates not only allow the surgeon to avoid shortening the metatarsal but also make lengthening possible. Bundy and colleagues8 showed that approximately 1% to 3% of lengthening can be expected with opening wedge base osteotomies. Other studies have shown average lengthening between 2.3 mm and 2.6 mm with the use of opening wedge plates. Although a concern of metatarsal lengthening is transfer pain, both of these studies confirmed the absence of transfer metatarsalgia after opening wedge osteotomy. Excessive hypermobility of the first metatarsocuneiform joint has not only been shown to be a causative component of hallux valgus but also affects the structural mechanics of the foot. An insufficient first ray can be linked to excessive pronation, overload of the lesser metatarsals, and abnormal motion of the first metatarsophalangeal joint. Signs of hypermobility include a flexible forefoot varus, diffuse hyperkeratosis under the second or third metatarsal heads, metatarsalgia, recurrent lesser metatarsal stress fractures, thickening of the second metatarsal shaft, and subluxation of the second metatarsophalangeal joint. Gellman and colleagues showed normal sagittal plane range of motion of the first metatarsocuneiform joint to be 5.7° of dorsiflexion and 5.8° of plantarflexion. Lee and colleagues determined normal total range of motion of the first ray to be 10.3° and it was measured at 12.9° in patients with hallux valgus. Although hypermobility was a previously identified entity of foot biomechanics, it was Lapidus who first described hypermobility of the first tarsometatarsal joint and a correlation to hallux valgus. Because of this connection he recommended fusion of the joint as a way to address the excessive mobility. Fusion of the joint has endured as the procedure of choice for hypermobility of this joint. More recent research provides a different insight into the relationship between excessive mobility of the first ray and hallux valgus deformity. Rush and colleagues showed a reduction in first ray mobility with the use of a proximal metatarsal osteotomy and concluded that first ray stability was linked to realignment of the windless mechanism. This finding showed that first ray hypermobility may not be simply a characteristic of the first metatarsocuneiform joint, but more a function of first ray alignment. Coughlin and colleagues and Coughlin and Jones were able to show a decrease in first ray hypermobility, but with use of a proximal crescentic osteotomy and distal soft tissue realignment. The study showed approximately 50% decrease in sagittal plane mobility of the metatarsocuneiform joint, from 11 mm to 5.2 mm. It is this malalignment and subsequent loss in windlass effect that may have a greater impact on mobility of the first ray than the first tarsometatarsal joint. The first described osteotomy at the base of the first metatarsal was by Loisin in 1901. In1903, Balacescu was the first to perform a proximal osteotomy, but it was not until later in the twentieth century that closing base wedge osteotomies gained popularity. This popularity coincided with improvements in internal fixation. By 1981, Youngswick described the closing base wedge osteotomy as the most popular procedure for severe hallux abducto valgus. The osteotomy was traditionally created in a transverse orientation, using fixation with Kirschner wires. The Juvara modification of the closing base wedge, which uses an obliquely oriented osteotomy, was implemented to increase contact surface and points of fixation. In recent years, the popularity of the closing base wedge osteotomy has diminished in part because of concerns of shortening. A 10-year to 22-year follow-up study showed an average shortening of 5 mm. Concerns also exist about stability of the osteotomy. If the medial hinge is left intact, the cortical bone provides additional stability. However, if the hinge is lost, the osteotomy becomes intrinsically unstable and deforming forces are not transferred across the osteotomy, which occurs in a chevron-type osteotomy. The first metatarsophalangeal joint is approached through a standard dorsal incision. The medial eminence is exposed and removed with an oscillating saw. The lateral soft tissues are released, including the capsule, lateral sesamoid ligament, and adductor hallucis brevis tendon. Extending the incision or making a separate incision to the first metatarsocuneiform joint allows access to the proximal osteotomy site. The incision length can vary depending on the choice of fixation. Using a 1.14-mm (0.045-inch) guide K-wire, the medial hinge is marked 1 to 1.5 cm distal to the metatarsocuneiform joint and the appropriate-sized wedge is removed using saw resection. If an oblique osteotomy is created, the hinge is placed approximately 5 mm from the medial edge of the first metatarsal base and directed at a 45° to 65° angle to the long axis of the first metatarsal. Using an oscillating or sagittal saw the distal bone cut is made followed by the proximal bone cut perpendicular to the weight-bearing surface with care to maintain the medial hinge. Do not attempt closing the osteotomy until after the guidewire is removed to reduce the risk of fracturing the medial cortex. A reciprocating motion can be used with the bone saw along the medial hinge to allow gradual closure of the osteotomy and good bone apposition. If sagittal plane correction is required to compensate for excessive shortening, the medial hinge can be transected and the distal fragment rotated plantarly. Distal translation of the osteotomy can also be performed to lengthen the first metatarsal after closure of the wedge osteotomy. Keep in mind that by sacrificing the medial hinge, the stability of the osteotomy can be compromised. Without appropriate fixation, unwanted postoperative rotation or translation may occur. Under fluoroscopic guidance, the osteotomy is stabilized with internal fixation. Different fixation techniques using K-wires, Steinman pins, screws, and plates have been described. Fillinger and colleagues showed 2-screw fixation to be more stable than single-screw fixation. Using standard Arbeitsgemeinshaft fur Osteosynthesefragen (AO) technique, compression screws or a low-profile locking plate can be used to address torsion, bending, and tension across the osteotomy. Once fixated, a distal osteotomy may be required to correct proximal articular set angle. The opening base wedge technique was first described by Trethowan in 1923, in which stability was maintained with intact lateral hinge and wedge graft. Because of concern with first metatarsophalangeal joint jamming from lengthening, Stamm recommended a concomitant Keller arthroplasty to eliminate this concern. He used the bone from the proximal phalanx base for use as bone graft in the opening wedge. Beronio described using the medial eminence of the first metatarsal head as a graft for the opening wedge osteotomy. This osteotomy is powerful in reducing the intermetatarsal angle and can also increase metatarsal length. In the retrospective study of 47 patients, the average intermetatarsal angle was reduced from 16° to 8° after surgery. Shurnas and colleagues found 3.2° of intermetatarsal angle correction per millimeter of wedge and 1.8 mm of metatarsal length gain. As mentioned previously, approximately 2 to 3 mm of first metatarsal lengthening can be expected depending on the size of wedge used. This lengthening can result in tightening of the soft tissues surrounding the first metatarsophalangeal joint and predispose it to jamming and decreased range of motion. A historical disadvantage of the opening base wedge osteotomies has been the requirement of internal fixation, which was suboptimal. As technology has advanced from a simple unthreaded wire to fixed-angle constructs, this concern has lessened and popularity has increased. Attention has now shifted to early weight bearing with the use of opening wedge plates, specifically locking plate designs. In Smith and colleagues review of 47 patients the average time to begin partial weight bearing was 13.5 days, and they recommended a locked plate system if attempting an aggressive postoperative weight bearing protocol. Wukich and colleagues started heel weight bearing at 2 weeks and progressed to full weight bearing as tolerated with a boot and crutches at 4 weeks with no transfer lesions reported in 18 cases. Saragas and colleagues started their patients on heel weight bearing in a wedged shoe with crutches/walker for the first 2 weeks in 64 cases, of which 1 developed a nonunion. Using a dorsal or medial incision, the first metatarsal head is accessed and the medial eminence is resected. The lateral soft tissues are released accordingly. A separate incision or extended incision can be used to create the proximal osteotomy. The author's preferred technique is through a separate medial incision, which allows access to the osteotomy site and placement of an opening wedge plate along the medial first metatarsal base. The osteotomy is created 1 to 1.5 cm distal to the metatarsocuneiform joint into metaphyseal bone with an oscillating or sagittal saw. The cut is made from medial to lateral with an attempt to maintain the lateral cortex. This result can be achieved with the use of a guidewire to mark the hinge. The generally recommended technique is to perform the osteotomy halfway between perpendicular to the metatarsal and the weight-bearing surface. Hardy and colleaguesvrecommended making this cut perpendicular to the weight-bearing surface, because they think this results in less sagittal plane elevation. An osteotome can be used to carefully open the wedge, with care to keep the lateral hinge intact. If using an opening wedge plate for fixation, most systems include an instrument to facilitate opening of the osteotomy. Fluoroscopy should be used to observe correction of the intermetatarsal angle and reduction of the sesamoid position. Described fixation techniques include K-wires and staples but the most common fixation has been low-profile wedge plates. The increase in popularity is secondary to the increased stability, use of variable wedge sizes, and ability for early weight bearing. Wedge spacers range in size from 2 mm to 7 mm and are determined by the size of the deformity. Recommendations include inserting the distal screw close to the osteotomy to allow stabilization of the osteotomy to the plate. The opening wedge can be filled with autograft from the medial eminence resection or allograft bone. The proximal chevron procedure is a horizontal V osteotomy of the first metatarsal base. That was first described by Kotzenberg in 1929, but more popularized by Sammarco and colleagues and Easley and colleagues. Because of the dorsal and plantar arms of the osteotomy, the proximal chevron has some inherent stability that can be lacking in other proximal osteotomies. It is this sagittal plane stability that can limit complications such as dorsiflexion. Easley and colleagues performed a prospective, randomized, comparative study between proximal crescentic and proximal chevron osteotomies. This study showed a shorter healing time and less metatarsal shortening with the chevron osteotomy. Dorsiflexion malunion is a problematic complication seen in some proximal base procedures, in particular with the crescentic osteotomy. This finding was seen in 17% of the crescentic osteotomies versus 0% in chevron osteotomy. Similar to other proximal osteotomies, a distal incision is created in order to resect the medical eminence. The proximal V osteotomy is made 1 cm to 2 cm distal to the metatarsocuneiform joint. A longitudinal incision is created medial and midaxial over the base of the first metatarsal. The incision is typically 4 to 5 cm in length, but may vary in order to achieve adequate exposure and can be an extension of the distal incision. Medial dorsal and plantar sensory nerves should be protected as well as the extensor hallucis longus tendon dorsally. The apex of the osteotomy is marked 1.5 cm distal to the metatarsocuneiform joint. The arms of the osteotomy are made at 45° to 60° to each other and may be directed proximally or distally depending on the surgeon's preference. If angled proximally, the osteotomy may be created slightly distally to allow for fixation without intrusion of the metatarsocuneiform joint. If the osteotomy extends too proximally it can intrude into the capsular region of the point and make translation of the osteotomy more difficult. Once the osteotomy is completed, the distal portion can be translated laterally and temporarily fixated in order to visualize reduction of the deformity. Translation of the osteotomy can be facilitated by providing medial force on the proximal fragment with the use of a clamp. At this point, some surgeons prefer to angle or slightly impact the osteotomy at the lateral aspect to allow further correction of the intermetatarsal angle. Because the translational osteotomy is limited by the amount of space between the bases of the first and second metatarsals, angulation can improve reduction of the deformity. Although helpful in deformity correction, this can also make the osteotomy less stable and increase difficulty in fixation. Borton and Stephens described the use of a dorsal medial wedge graft for angulation of the osteotomy as opposed to increased compression along the lateral aspect of the osteotomy site. This technique also allows slight plantarflexion at the osteotomy site to adjust for potential shortening and dorsiflexion. Allograft can be used, but some surgeons have advocated the use of the resected portion of the medial eminence as the graft. Several variations of fixation have been recommended for this osteotomy. Although initially described without fixation, the use of screws allows a more stable construct than with Kirschner wires or staples alone. The most common construct is 1 or 2 screws placed dorsally from distal to proximal. Sharma and colleagues used a plantar-to-dorsal screw placement in a cadaveric study and showed increased stability using this screw orientation compared with a dorsal-to-plantar screw. They advocated that, with the incision location being medial, a plantar-placed screw is no more technically difficult than one placed dorsally. Supplemental transverse K-wire fixation has been described to improve stability. Easley and colleagues recommended the use of a medial locking plate because it provided good stability and allowed early weight bearing. Popularized by Mann and colleagues7 in the early 1990s, the proximal crescentic osteotomy uses a crescentic or arcuate bone cut. Deformity correction is achieved through rotation of the distal fragment along the osteotomy site. With a rotational osteotomy, correction of the deformity can easily be adjusted by either medial or lateral rotation of the distal fragment to make minor adjustments without the necessity of additional bone cuts or grafts while limiting shortening. The crescentic osteotomy was originally described as a through-and-through cut of the metatarsal base. The major problem with this technique was difficulty in fixation. Because of this, instability and dorsiflexion malunion were the major pitfalls of the procedure. In Mann and colleagues’ original studies they reported a malunion rate of 28%. Despite this, patients had a 93% satisfaction rate. Veri and colleagues used a similar technique, resulting in 94% patient satisfaction over a 12.2-year follow-up. Thordarson and Leventen reported a 93.5% satisfaction rate among 33 cases with an average follow-up of 28 months. Variations of the crescentic osteotomy were developed to limit these complications. The most widely used modification of the osteotomy is a crescentic shelf procedure, which was originally described by Cohen and colleagues. This procedure converts the crescentic osteotomy into a more stable and reproducible construct by combining a dorsal-to-plantar crescentic osteotomy and a medial-to-lateral transverse osteotomy at the base of the metatarsal. The plantar shelf is created to facilitate fixation options while maintaining the precise corrective ability of the rotational osteotomy and limiting shortening. Stability of the osteotomy site is the key component in reducing or eliminating malunion of the crescentic osteotomies. Fixation options include K-wires, screws, and dorsal plates. The medial eminence is addressed per typical protocol. The proximal crescentic osteotomy is performed through a dorsal, longitudinal incision over the base of the first metatarsal. A 3-cm to 4-cm incision is normally required, but may be lengthened depending on fixation choice or adjunctive procedures. The osteotomy is performed 1 to 1. 5 cm distal to the tarsometatarsal joint with a crescentic blade. The crescentic blade is available in several sizes and is chosen based on the width of the metatarsal. The osteotomy can be created with the concave surface facing distally or proximally. Several investigators advocate having the convex surface face distally to dissipate the retrograde deforming forces at the osteotomy site.40 Doing so also allows greater bone contact along the osteotomy site and eliminates the medial prominence created by the rotated base of the distal fragment. Using the blade, the osteotomy is created from dorsal to plantar and perpendicular to the weight-bearing surface. This technique allows movement of the distal fragment laterally without unwanted dorsal or plantar movement. The blade is gradually rotated back and forth in a medial-to-lateral rotation along the inherent arch of the blade. If the blade is too narrow compared with the metatarsal, it is best to complete the osteotomy through the lateral cortex and use a straight blade to transect the medial cortex. Because the osteotomy is rotated laterally, the medial cortex does not factor into the osteotomy correction. Attempting to complete the osteotomy laterally in this situation may not only affect the correction but puts the comminuting artery between the base of the first and second metatarsals at risk. The crescentic shelf osteotomy is a variation of the procedure that provides added stability and room for fixation. The created shelf may be a long or short arm depending on the fixation desired. A long plantar shelf allows for multiple screws that aid in rotational stability in addition to sagittal plane stability. When using a plantar shelf, the surgeon should create the plantar osteotomy first in a medial-to-lateral direction in the plantar one-third of the metatarsal bone. Care should be taken to make this as close to parallel as possible to the weight-bearing surface. A K-wire can be placed to guide the osteotomy in the correct orientation. This technique is helpful because abnormal deviation of the saw blade either medially or laterally in the coronal plane can result in abnormal sagittal plane movement at the osteotomy. The crescentic blade is then used to create the osteotomy in the dorsal two-thirds of the metatarsal using the technique described earlier. Once the osteotomy is created the distal fragment is rotated laterally. This fragment is visualized using intraoperative fluoroscopy to avoid overcorrection. To facilitate positioning of the osteotomy, the proximal metatarsal fragment can be pulled laterally with a bone hook or clamp. Kirchner wires are used for temporary fixation. Permanent fixation is placed consisting of wires, screws, or a plate. Many clinicians have recommended use of a dorsal plate as the primary or supplementary fixation because of its increased strength and load to failure compared with single-screw fixation. As with any procedure, complications are of big concern when choosing the appropriate surgical plan. When dealing with common disorders such as hallux abducto valgus deformities, complications are common. Whether performing a distal, midshaft, or proximal metatarsal procedure, similar complications are to be expected such as hallux varus, recurrence, or joint stiffness. The complications most commonly associated with proximal metatarsal osteotomies are discussed later. Delayed union, shortening, elevation, and injury to the dorsalis pedis artery are the most problematic complications specific to this procedural subset. Nonunions are of concern with any osteotomy, including those performed during correction of a hallux valgus deformity. Potential reasons for a nonunion in proximal osteotomies of the first metatarsal include vascular injury, thermal necrosis, infection, inadequate fixation, or excessive tension forces at the osteotomy site. Smith and colleagues reported an 8% rate of delayed union or nonunion with use of a nonlocking opening wedge plate and 0% when using a locking plate design. With closing wedge osteotomies, reported nonunion rates have been low with few to no reports of union complications. This finding is most likely secondary to the larger bone contact area with an oblique osteotomy and multiple points of fixation. The crescentic osteotomy has reported consistently low rates of nonunion despite varying rates of malunion. With any osteotomy at the proximal first metatarsal, the dorsalis pedis artery is at increased risk of injury. The dorsalis pedis artery is a continuation of the anterior tibial artery. It courses along the dorsal aspect of the midfoot and divides into the deep plantar artery and first dorsal metatarsal artery in the proximal aspect of the first metatarsal interspace. This division typically occurs 10 mm distal to the first metatarsocuneiform joint. The deep plantar artery passes between the bases of the first and second metatarsal bones in a dorsal-proximal to plantar-distal direction. It forms the plantar arterial arch in combination with the lateral plantar artery. The plantar arch provides blood supply to the metatarsal heads and toes. Chuckpaiwong and Korwutthikulrangsri performed an anatomic study evaluating the safe zone for proximal osteotomies of the first metatarsal head. Dorsally along the first metatarsal, the artery is present approximately 1.2 cm from the joint. Plantar, the artery is at risk 2.3 cm from the joint, which creates a triangular-shaped safe zone at the first metatarsal base, which is typically only of concern with osteotomies that break the lateral cortex of the first metatarsal, such as in the proximal chevron, closing wedge, and crescentic osteotomies. Shortening is a complication with many osteotomies, especially when there is wedge resection for deformity correction. Banks and colleagues used mathematical and experimental models to determine metatarsal shortening with closing base wedge osteotomies. Osteotomies of 5°, 10°, and 15° resulted in shortening of 1.1 mm, 1.7 mm, and 2.5 mm, respectively. Day and colleagues found a 2.2-mm average shortening in first metatarsal length with closing base wedge osteotomies. In a mathematical model, Kummer showed 2.6 mm of average shortening. It is this significant change in length that makes minimal shortening osteotomies of the first metatarsal base appealing in the surgical setting. Sammarco and colleagues measured approximately 2 mm of metatarsal shortening with a proximal chevron osteotomy. Computer analysis showed shortening of 1 mm with the crescentic osteotomy, although slightly more shortening should be expected with saw blade excursion and possible bone resorption. Elevation of the first metatarsal is a result of dorsiflexion malunion of proximal first metatarsal osteotomies or poor surgical technique. The crescentic procedure has historically been associated with the highest rate of malunion. Several studies have reported malunion rates with this osteotomy. Percentages of dorsiflexion malunion have been reported at 28% for Mann and colleagues,7 17% for Easley and colleagues,31 and 9% for Zettl and colleagues. Thordarson and Leventen found an average of 6.2° of dorsiflexion with crescentic osteotomies. Pearson and colleagues saw an average of 7.1 mm of dorsal displacement. Studies have shown a direct correlation between medial-to-lateral coronal tilt with the osteotomy and elevation of the metatarsal. Modifications of this osteotomy, changes in fixation, and increased awareness of complications have resulted in a lower rate of dorsiflexion malunion. Even in other proximal osteotomies, elevation has been a common complication. Schuberth and colleagues identified elevation of the first metatarsal in 93.7% of patients who had closing based wedge osteotomies. Despite this, they were unable to determine whether the elevation was from the intraoperative setting or postoperative migration. Wanivenhaus and Felder-Busztin noted a 60% incidence of dorsal displacement with this osteotomy. With dorsal angulation at the osteotomy, transfer metatarsalgia is of great concern. Although Mann and colleagues noted that dorsiflexion of the first metatarsal did not influence transfer lesions, others have reported incidences of transfer metatarsalgia at 40% or more. The ideal osteotomy for a bunion deformity is one that corrects intermetatarsal angle and hallux abductus angle while avoiding unwanted complications. Proximal metatarsal osteotomies can be a good procedural choice for correction of hallux valgus deformities. In the past, these procedures have been hindered by complications and limitations such as delayed union, malunion, long periods of immobilization, and high requirement of technical skill. Improvements in fixation and technique allow successful use of proximal osteotomies and limit these complications. Osteotomies of the proximal metatarsal should be considered for a wide range of hallux valgus deformities and hold benefits that allow expanded use beyond severe deformities. 36. Easley ME, Darwish HH, Schreyack DW, et al. Proximal first metatarsal osteotomies. In: Saxena A, editor. International advances in foot and ankle surgery. London: Springer; 2012. p. 11–25.